Here is another small advancement in technology that can make a big impact helping to save paper. Millions of people visit movie theaters weekly and the internet has revolutionized ticket purchasing, but for the most part you still have to print out a confirmation or a barcode. 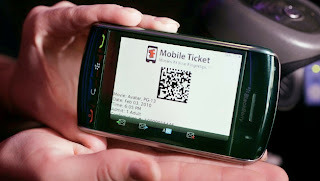 However, a new application from Fandango allows for a barcode to show up on your mobile phone that can be scanned at movie theaters. Last month I visited a Green Expo and they were using the same technology for visitors to get company brochures and product information. A very cool concept but many of the scanners did not work. I am not worried about this technology as this is something that will work and it is just a matter of time for moviegoers to get used to. The new system is currently being tested in select markets and you can see the list at the full article.